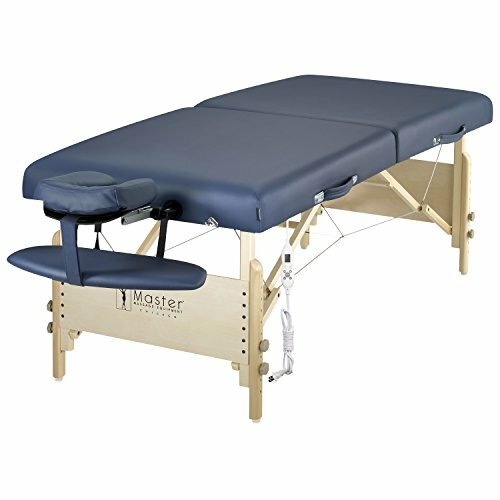 Master Massage 30'' Coronado Therma Top LX Portable Massage Table Package, Royal Blue by Master Massage at Doctor Joe Says. MPN: MHP 26629. Hurry! Limited time offer. Offer valid only while supplies last. 30" width x 84" length x 24" to 34" adjustable height, the table itself only weighs 34lbs. 1,500lbs. aircraft-grade steel support cables gives the table a working capacity of 750lbs. Free Accessories Include: Master Innovated ErgonomicDream adjustable face cradle, memory foam face cushion, four-pocket carrying case, fully padded armrest shelf. If you have any questions about this product by Master Massage, contact us by completing and submitting the form below. If you are looking for a specif part number, please include it with your message.